In the future, there is no United States of America. Instead, there is Panem, which consists of a powerful capital and 12 districts that are strictly controlled. Every year, each district must offer up two children to be sent to the Hunger Games, where they will fight to the death until just one remains. When her little sister's name is called, Katniss takes her place in the arena. She joins the other district 12 tribute, Peeta, as they fight to stay alive. 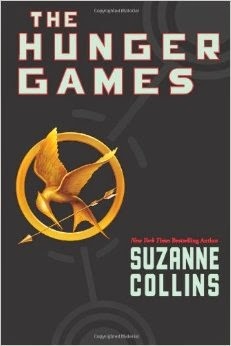 The Hunger Games by Suzanne Collins was actually a book club pick, and I wasn't sure what to think when I first picked it up. But I absolutely loved this book. I could not put it down. The characters were all very well developed. The storyline is absolutely gripping. Everyone in my book club liked it. Collins' concept of the future was fascinating and well thought out. The games themselves were detailed and harsh - an extreme example of reality TV - but not overly gruesome. I highly recommend this book. This review was written based on a copy of The Hunger Games that I borrowed from a friend. This is on my "to-read" list. I'm actually #285 on the waiting list at the library. :) Trying to cut down on my book budget. Whew I love books. I've heard this is very good. Looking forward to it even more after your review.